PDFs showing series 5 Mixels and the Max model for each tribe have been found at LEGO.com by Ice Ender. I believe they are the first official images of them to emerge. I would link to the source but he didn't tell me where he found them. They are due for release in June which means we'll probably start seeing them in shops in May. What do you think of them? Still exciting, or losing some of their appeal? Some nice looking ones there but I think the theme of each tribe is getting harder to identify at first glance, especially with repeated colours/themes - I'm amazed we haven't seen any leafy/plant looking ones yet. I still like the Mixels as a parts source , but it seems to become slightly repetitive in terms of 'themes'. I'm just so bored of Mixels now. For me, they hit a high with the adorable (and very useful) Scorpi, and everything since has just been a downhill slide. 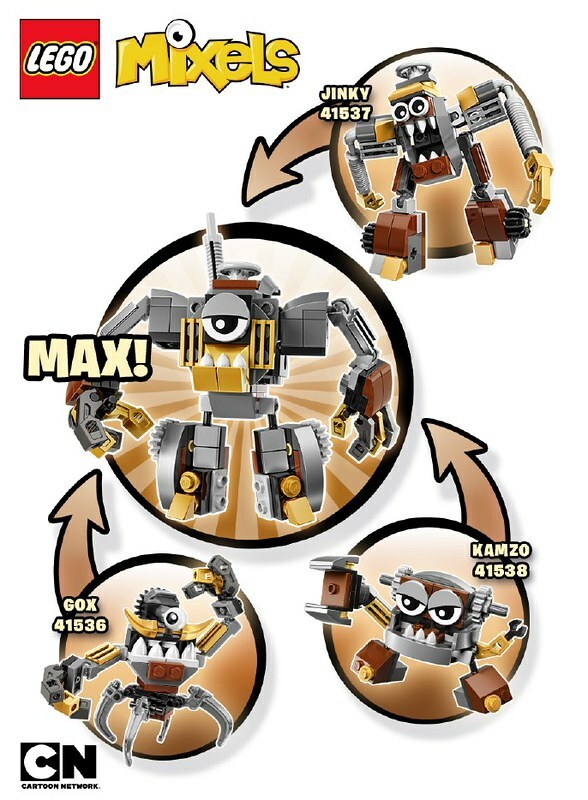 http://www.lego.com/en-us/mixels/explore/downloads/building-instructions/41536_41537_41538 The Mixels Wiki found these awhile ago. I'm not sure I have much use for more gear wheels. But the extra blue parts may be useful ? Some leafy ones would be great in series 6. I think they're great. These little guys have great parts and are very characterful - the Klinkers look to be my favourites of this series. I only got into the Mixels this year, so don't have any Series 1 and only a few of Series 2 - these new Frosticons might give me a chance to get parts to rebuild the original ones. for the first time I NEED the steampunk MAX!!! 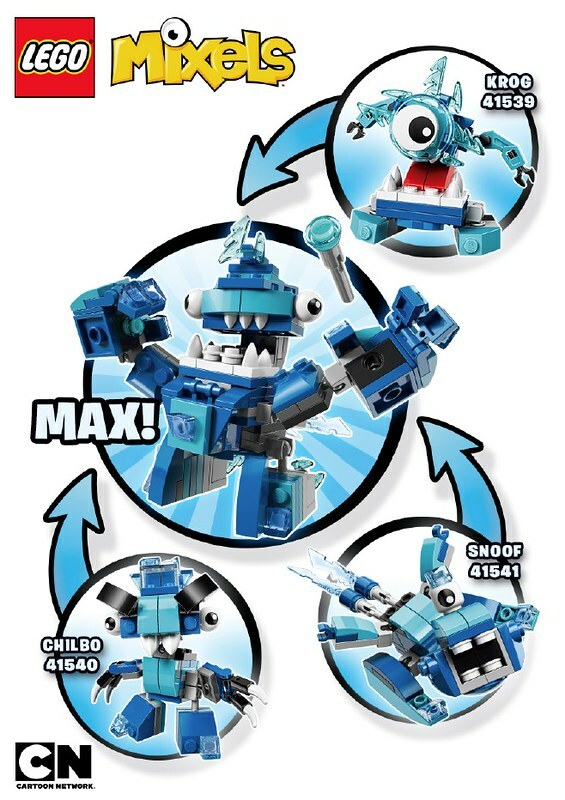 ^^ There are green Mixels in Series 6, but it's a second series of the Glorp Corp, not a plant tribe. I don't really like the tribe expansions, but the other two tribes are great.The Klinkers' concept (a scrap-metal junkyard tribe) is really neat, and the Lixers look silly and entertaining. I have to say that I'm not a mixels fan but these look pretty nice! Wow, Steampunk Mixels? They look great! You know what I like the most about Mixels, parts that are uncommon in small sets, such as bushes and the truck exhaust stack included in the less than $5 sets. Needless to say, Jinky is a parts goldmine. Every time I buy a Mixel for parts I inevitably build it up first and then become too attached to it to use it for parts. DARN YOU, YOU ADORABLE FREAKY MONSTERS! ...Anyway, I'm seeing good parts in the "Lixers" tribe, looks like there might be a very slightly higher than average piece count with them. That trans orange tooth piece in Spugg intrigues me. ^Same with me. I bought one almost a year ago for the bush on its head, I built it, and I've never taken it apart. Snoozers. Does anyone even care any more? After the novelty of the first wave there was nothing unique about this line. Unlike the Collectable Minifigures Series, there's little in the way of newness to get excited about, they're basically just small, appropriately priced brick packs. Curious if even kids still care. Is the TV show on anymore? @DanRSL: I think if you read the comments above yours you'll see that there are quite a few people who care. How is there nothing new or unique to get excited about? Each series brings new wacky characters with their own distinctive looks, like the catlike Spugg, the oafish-looking Turg, or all the mechanical-looking Klinkers. I personally can't bring myself to get invested in this line, since BIONICLE, Ninjago, and Elves are commanding so much of my attention and budget, but the Mixels theme continues to bring lots of charm and personality with each new release, and it shouldn't surprise anybody that it's been successful enough to continue this long. Im glad I sold all of these I had and am bowing out. . . . . because I couldnt afford all this awesomeness. This line is awesome and if I werent so Star Warsy with my collection, I would of kept grabbing these guys up. Klinkers are awesome!!! The Lixers and Klinkers amaze me. Bring on the purple Vaka-Waka! Maybe they should do less a year because these are lacking. Give me some pink, lilac or medium azure mixels and I'll buy dozens of them. My wife and kid love them. My overall interest is waning and, at this point, I'm mainly interested in the results of future building competitions. BUT...I'm with Brainslugged all the way! 10694 Creative Supplement Bright was a day one purchase for me this year. Series 6 contains a purple/lilac tribe, you'll be glad to hear, then. @Brainslugged: And the Frosticons from this series pictured here use Medium Azur extensively. Still no pink Mixels, though. You'll also notice a lot of people expressing disinterest and fatigue. And wackiness? They've all been wacky, like I said the novelty is completely exhausted. As someone who grew up in the 80s-90s creature craze, I appreciate a good oddball freak/mutant/whatever. These are just so samey. Maybe the appeal is more for "tribal"-type fans? I've also never liked Bionicle, maybe there's something to a "tribe" collecting mentality that some Lego/toy fans have and I just don't? I don't know, I wanted to like the Mixels but had almost instant buyers remorse when I bought my first and only one. I think there's something about the scheduling and availability, too that rings wrong to me. You'll notice I did ASK about the success, though (I'm not being rhetorical or sarcastic). I am genuinely curious how it's been received because this was a very hyped line. Apparently Hero Factory and Chima have been RELATIVE failures (right? I'm not positive) so I'm curious to think through Lego's in-house branding based on their success. Also, I absolutely elect me as Max Mixel of the Grumpsters!